Interstate Connecting Components, a division of Heilind Mil-Aero, is now stocking TE Connectivity’s harsh environment CII FC-325 Series Relays. Interstate Connecting Components, a division of Heilind Electronics and a leading distributor of harsh environment connectors and backshells worldwide, has added CII FC-325 Series relays from TE Connectivity (TE) -- a global leader in connectivity and sensors. These non-latching relays are constructed with a double make/break contact design for added durability. Additionally, features like hermetic sealing, a corrosion-protected metal can, and an all-welded enclosure make FC-325 Series relays more reliable than similar alternatives. 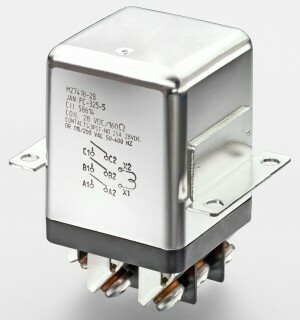 TE Connectivity CII FC-325 Series relays are qualified to MS27418 – and at 25A, they accommodate higher current ratings than standard M83536 mid-range versions. FC-325 Series relays are ideal for applications like launch systems, power distribution, fuel pumps, navigation and weapon systems, aircraft cabins, and ground support equipment. Visit ICC's website for more information about TE Connectivity CII FC-325 Series Relays. Founded in 1985, Interstate Connecting Components (www.connecticc.com) is an AS9100C-certified value-added distributor of the entire spectrum of electronic connectors, fiber optic connectors, backshells, tools, cable marking systems, and connector contacts. A division of Heilind Electronics, North America’s largest interconnect distributor, ICC specializes in the military-aerospace market and offers T'DA® 2-day assembly on D38999, M28840, and many other mil-spec connector lines. Follow ICC on Facebook atfacebook.com/connecticc and on Twitter at twitter.com/connecticc. TE Connectivity is a $12 billion global technology leader. Our connectivity and sensor solutions are essential in today's increasingly connected world. We collaborate with engineers to transform their concepts into creations - redefining what's possible using intelligent, efficient and high-performing TE products and solutions proven in harsh environments. Our 72,000 people, including over 7,000 engineers, partner with customers in close to 150 countries across a wide range of industries. We believe EVERY CONNECTION COUNTS. CII, TE, TE Connectivity, and EVERY CONNECTION COUNTS are trademarks.